Can you confirm these amateur observations of Cricosaura typica? Type locality: “südlichsten Theil der Insel Cuba, am Cabo Cruz”. Comment Cricosaura typica is the only cricosaurine representative. It differs from the other xantusiids in possessing two frontonasal scales, one frontal scale, no parietal scale, and a fourth finger with four phalanges. Type species: Cricosaura typica GUNDLACH & PETERS, in PETERS 1863: 262 is the type species of the genus Cricosaura GUNDLACH & PETERS 1863. Cricosaura is the type genus of the subfamily Cricosaurinae SAVAGE 1963: 13. Peters, W. 1863. Über eine neue von Hrn. 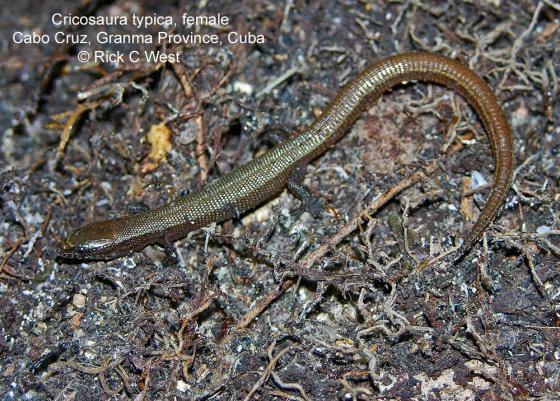 Dr. Gundlach auf Cuba entdeckte Sauriergattung, Cricosaura typica Gundlach et Peters. Monatsb. Königl. Akad. Wiss. Berlin 1863: 362-370.